In planning for the upcoming 2016 Pacific Cup—a race that takes sailors from San Francisco to Oahu, Hawaii—I was interested in tools for predicting the optimal route. Depending on the location of the Pacific high-pressure system and El Niño, sailing the rhumb line may not be the fastest course. 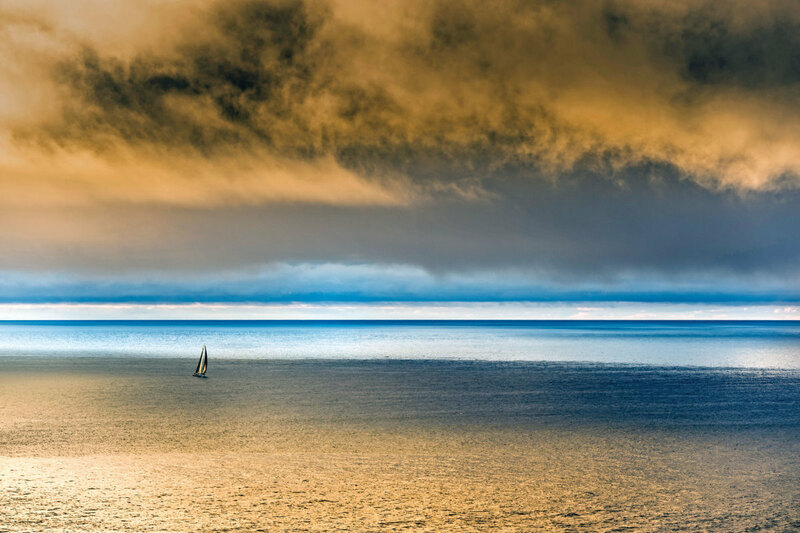 The old rule of thumb is to sail with the trade winds and then head toward Hawaii. This is an oversimplification of a challenging navigation problem. With laptop computers and tablets, you have sophisticated tools to plan an optimal course. Proper routing can save hours, if not days, on long-distance passages and—more importantly—adds to the safety or comfort of the trip. The key component of weather routing is the forecast data, which is available from several sources, including the National Weather Service (NWS), NOAA’s Global Forecast System (GFS) and the Canadian Meteorological Centre (CMC). The NWS runs the GFS weather forecast computer model four times a day (at 0000, 0600, 1200 and 1800 hours Coordinated Universal Time) and has up to 15 days of forecast data available. The smallest data grid resolution is 0.25 degrees with options for 0.5, 1.0 and 2.5 degrees. The forecast includes wind speed and direction at 10 meters above sea level, mean sea level pressure, significant wave height, mean wave direction, temperature, precipitation, cloud cover and other information. GFS data is the most widely used source for weather forecasts and is commonly delivered via GRIB (Gridded Binary) files. PredictWind is a commercial service that, in addition to providing GFS and CMC forecasts, offers two proprietary weather models (PWG and PWC) based on GFS and CMC data. For coastal areas worldwide the company also combines local observations to provide high-resolution GRIB files at 8km and 1km resolution. PredictWind’s free subscription provides worldwide coverage at 50km (1 degree) resolution, with higher resolution data available as a paid subscription. GFS GRIB files are available directly from NOAA and the NWS and can be downloaded from their FTP site or by sending an email request, though navigating the NWS’s website and folder structure seems overly complicated. There are several easier options for obtaining GRIB files. [advertisement]SailDocs (saildocs.com) is an on-demand GRIB retrieval service first developed for requesting weather data over high-frequency radio. Requests are sent by emailing the website with the requested parameters coded in the body of the email. The parameter fields include coverage area, grid resolution (degrees), valid times (hours) and specific weather data elements. SailDocs is very easy to use and is well suited for limited bandwidth connections. Additionally, SailDocs offers a recurring subscription, so the GRIB files can be automatically delivered to your email address. 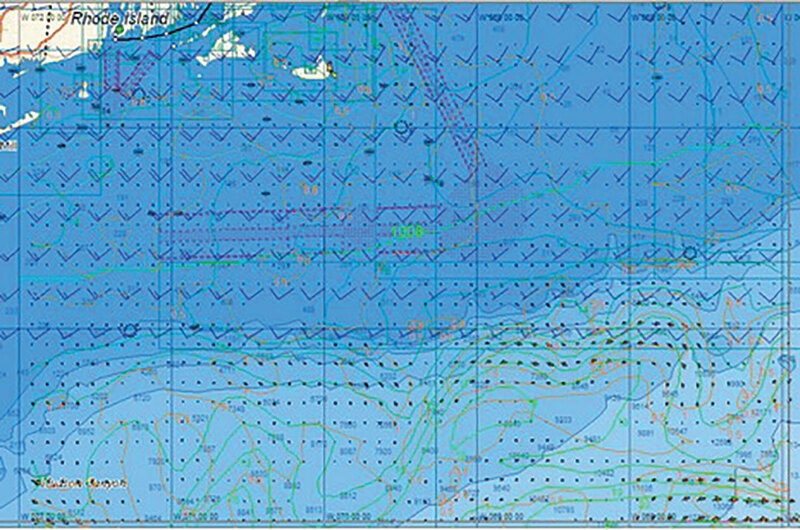 Global Marine Networks or GMN (globalmarinenet.com) also offers seven-day wind forecasts, available for download or via email, optimized for low-bandwidth connections. To request a GRIB file, send an email to gmngrib@globalmarinenet.com with the request key as the subject line. GMN is now included in Iridium XGate Satellite Data Service. PredictWind Offshore App (predictwind.com) for Windows, Mac OS X, iOs and the Android operating systems is a convenient way to download offshore GFS, CMC, PWG and PWC GRIB files for up to 14 days, high-resolution PWG and PWC GRIB files, GMDSS forecasts, satellite imagery, and optimized weather routes. The downloaded GRIB files can be opened and viewed in various ways. Later this year, the Offshore App will include a GRIB viewer. There are many stand-alone GRIB programs available. In particular, on the desktop computer, zyGrib (zygrib.org) for Windows, Linux and Mac OS X is a very easy-to-use GRIB downloader, viewer and weather visualization program. The zyGrib program combines NOAA GFS forecasts for up to 10 days in three-hour increments at 0.25-degree resolution. The program also supports high-resolution Numerical Mesoscales Model (NMM) forecasts for up to three days in one-hour increments and global wave data from Fleet Numerical Meteorology and Oceanography Center (FNMOC). The desktop application forms the request with the selected region and data elements, and beautifully animates this data on your desktop. Another easy-to-use download service and program is UGRIB (grib.us) for Windows. UGRIB supports the download of GRIB data for seven days, at 0.5- or 1.0-degree resolution, and includes wind, rain and air pressure. On the iPad, Weather4D is a stunning app for downloading and visualizing forecasts for up to 10 days in three-hour steps at 0.25-degree resolution. You can also request and import GRIB files from SailDocs. The Pro version has a weather-routing feature. There are many other programs available to download GRIB files, though these are the most popular. To calculate the optimized route, you need your boat’s performance data, typically polars, which are a graphical representation of the target boatspeed at different true wind speeds and true wind angles. Polars are often available from your boat’s designer, US Sailing or, if you are lucky, they may be included with your navigation and routing program. Since polars are theoretical speeds based on wind conditions, they may not accurately represent your true boatspeed in real-world conditions. There is no standard for representing polar data among the various programs. Several programs read a TWA\TWS CSV format. Wind speeds are specified as columns, rows are the wind angles, and the boatspeed is in the cells. Other programs read a polar file with wind-angle and boatspeed pairs specified for each wind speed. Using a designer’s polar diagram, you can create a spreadsheet and save the data in a CSV format or text file as required. There are also programs to graphically draw your boat’s polars or estimate your polars, based on displacement, length and other parameters. Weather-routing tools can provide valuable information for the fastest or safest route and options to avoid bad weather. These tools are available on all computers and tablets and for a variety of operating systems, such as Windows, Mac OS, iOS and Android, with most tools freely available. All of the programs I tested worked essentially the same and gave surprisingly similar results. The choice of one program over the others comes down to whether you are using a Windows PC or Mac computer, or an iOS or Android tablet, and your method for downloading data (either email attachment or GRIB file download), SSB or Iridium Satphone. Each provider offers the GFS and CMC forecasts with varying levels of resolution and selected weather elements. The size of the downloaded file is proportional to these factors. I prefer GRIB download programs that allow setting these values (e.g., SailDocs, zyGrib). For any of the programs, there is a learning curve to climb to automate weather routing. You need to understand the weather forecast models, the boat’s performance data, and the isochrone routing model. Each program has its own way of managing routes and setting up the optimization. The optimized results are totally dependent on the quality of the data in the underlying GRIB file. Many of the programs aim to be an all-in-one navigation and planning package and include tools for managing GRIB files, weather routing and real-time monitoring of the boat’s instruments. This provides a single program to learn how to use. The most commonly used model is to request a GRIB file from SailDocs is the most commonly used model. Nobeltec, Weather4D, zyGrib, UGRIB and PredictWind also supply forecast data and have built-in support for downloading GRIB files. As with any navigation program, you need to be careful which time-zone you are working in. Many of the programs allow for selecting a time-zone, while others assume GMT. Once you have the optimized route, it is helpful to load the route into a chartplotter or a computer with a navigation program to track your progress. All of the programs export the route to a GPX or KML file. A key feature is to be able to rerun the optimization with a new GRIB file, using the boat’s current position and current time.